Today culminated one more workshop on Transferable Research Skills led by Dr Dorina Baltag from the Politics Department at Maastricht University and her project partner, Mrs. Adina Petre, owner of Insights, the local coaching company in Maastricht. Together they designed a dynamic training, with hands-on exercises, created specifically in a manner that help participants identify their set of skills, find them in their CV, categorise them and understand how these are transferable for a non-academic job market. Whereas in the first part of the workshop female researchers learned how to transfer their experience from their PhD and postdoctoral studies into generic skills useful on the labour market; in the second part – invited guests shared their career path and lessons learned while discussing the relationship of women and research and the interconnected worlds of business and academia. 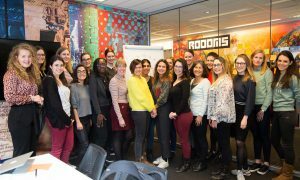 This workshop is the first in the series of activities on Entrepreneurial Thinking for Female Researchers, the project part of the grant scheme on Diversity & Inclusivity, part of the Diversity at the CORE policy at Maastricht University. To follow the developments of this project, connect to the Facebook page.